Sydney Skiver extends the bat on a pitch. 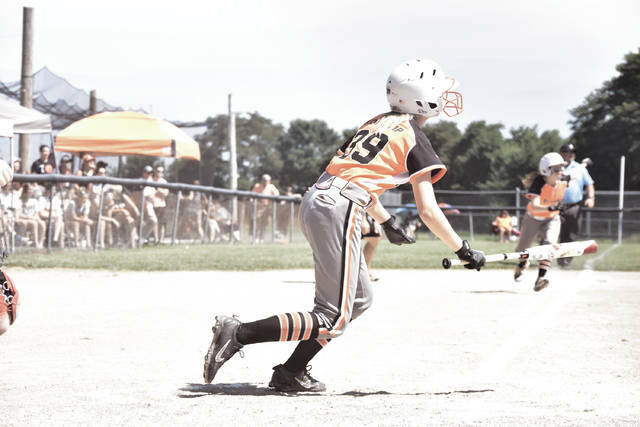 Wheelersburg’s Ashlee Spence, behind strong pitching control and a rock-solid defense, threw a no-hitter against Canfield to move the ‘Burg 11-12 Softball All-Stars to the Ohio 12U Softball Championship Round. Maddi Kotcamp watches a ball as it sails into the outfield. 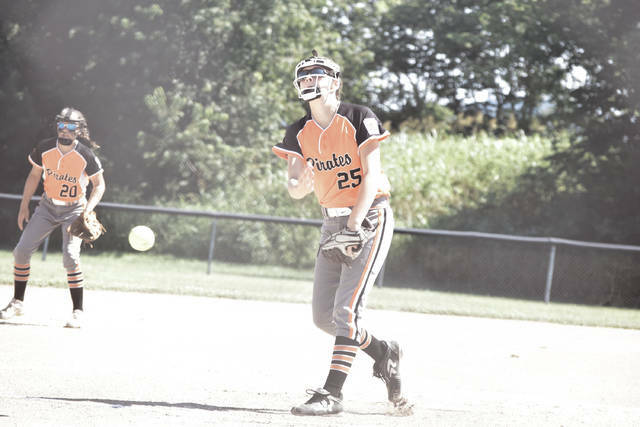 WEST PORTSMOUTH — Winning in a variety of ways is certainly not unfamiliar to the Wheelersburg 11-12 Softball All-Stars. After all, it is a group that has won a litany of games together over the years. That was proven once more on Sunday afternoon when the 11-12s, after fighting to scratch out a game-winning run against a powerhouse unit in Tallmadge, handled a similarly-skilled opponent with relative ease. Maddi Kotcamp’s bases-clearing triple in the bottom half of the opening frame, along with an pinch-hit RBI single by AndiJo Howard, and last, but most certainly not least, a gem of a pitching performance that ultimately resulted in a no-hitter from Ashlee Spence, allowed Wheelersburg to collect a 6-0 victory over the Canfield 11-12 Softball All-Stars on Sunday at Doc Singleton Park in West Portsmouth and seal a berth in the 12U State Championship Round. For Dusty Salyers, the veteran leader of the 11-12s believed that his girls made a statement that reverberated throughout the hallowed grounds of the famed facility on Sunday. On Sunday, however, it was the offense that picked up the remaining pair of areas as opposed to Saturday, when the exact opposite was the case. After a quick three up, three down inning for Canfield, Rileigh Lang wasted no time leading off the bottom half of the Wheelersburg frame with a single, and after stealing a base, advanced to third on a Sydney Skiver single that dropped in the middle of the infield, with Skiver ultimately moving to the second on the attempted throw to nab the speedy Lang at third base. When Haley Myers was intentionally walked to create a force play at any base, Kotcamp made Canfield pay dearly for the intentional walk by blasting a ball past Canfield’s shallow playing outfield. This allowed Kotcamp’s well-hit pitch to roll within 20 feet of the center field fence, and, in the process, allowed all three runners to score as Kotcamp slid into third base with a bases-clearing triple. As a result, Wheelersburg had a 3-0 lead, and from there, never looked back. When Spence struggled early in the top half of the second inning with her command, the Wheelersburg defense picked Spence up in a big way. Following a Macey Kalina walk, Emma Campbell grounded right to Sydney Salyers, who, instead of flipping to second base in an attempt to turn a 4-6-3 double play, made the road much easier for herself by tagging Kalina out on the baseline before firing to first en route to turning a 4-unassisted-to-3 double play. Catie Boggs added in an impressive defensive play of her own by catching a hard-lined shot by Malena Toth to allow Spence to face the minimum in the frame. Kotcamp then ran down a soft fly ball into shallow center field to give the ‘Burg 11-12s a trio of web gem-esque defensive plays for the afternoon. Other than a minor struggle in the second inning that led to the Kalina walk, Spence executed the gameplan to near-perfection by striking out five batters and facing just two batters above the minimum for the entire contest. Howard then added in a critical two-out RBI following a single and a steal of second base by Kotcamp to increase the lead to a 4-0 tally after three innings of play, and singles by Lane and Sydney Salyers in the fourth frame were followed by an infield error that allowed both players to score, which set the final margin. 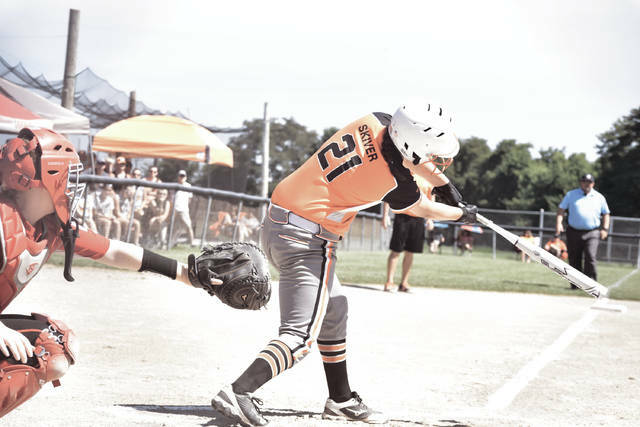 With the victory, the Wheelersburg 11-12s will advance to play in the 12U Championship Round at 10 a.m. Monday morning, where a rematch with either Tallmadge or Canfield awaits. And even if the Lady Pirates don’t win the initial matchup, a victory in the second and final contest at 12 p.m. will give Wheelersburg the title.